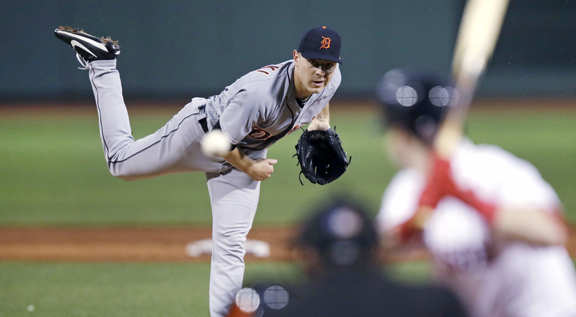 BOSTON — Steven Wright needed a few pitches to get Detroit off balance, then kept the Tigers guessing for seven innings. “There were definitely a lot of emotions going in — good emotions, but it’s something that I’ve got to keep in check,” said Wright, who had surgery on his left knee last May that cost him most of the 2017 season. Former Tiger J.D. Martinez hit his 20th home run for Boston, and Xander Bogaerts led off the fifth with his ninth of the season. Wright was grateful for the offense as well as defensive support he got after walking Leonys Martin to start the game. Nicholas Castellanos followed with a double off the Green Monster, where Andrew Benintendi fielded the bounce and threw a strike to Bogaerts, who relayed home in time for Christian Vazquez to tag out Martin. Wright (2-0) made six relief appearances before getting the start, allowing only two hits with six strikeouts and three walks. Castellanos, who also singled in the third, was the only Detroit player with a hit against Wright, who retired the last 13 batters he faced. Dixon Machado’s two-out single in the eighth against reliever Hector Velazquez was the only other hit for the Tigers, who have lost three of four. “Well, it’s a slow pitch but it doesn’t ever do the same thing twice in a row,” Tigers manager Ron Gardenhire said.